Last week UFCW Local 401 submitted an application to unionize the security guards of All Peace Protection in the Regional Municipality of Wood Buffalo. We are extremely excited that All Peace will be joining our membership. Unfortunately, typical of most organizing campaigns leading up to a Union vote, UFCW 401 is combatting negative propaganda from the Employer. There have been two Memo’s by the employers of All Peace Protection warning employees that talking about the Union during company time may result in the discipline or termination of employees; threatening Employees for exercising the right to associate with a Union is illegal. The union will be filing charges at the Alberta Labour Relations Board (ALRB) to protect the hard working Union members at All Peace Protection. Employers like to mention that the Union is unable to make guarantees and that the Union will take away the employees voice; these are lies. UFCW Local 401 guarantees that we will never negotiate worse working conditions than those already in place. The Employer has the legal obligation to negotiate in good faith, which means they must be willing to meet and work together with the Union to put in place a Union Contract. The Union means the employees of All Peace Protection will finally receive representation and protection, we will never silence our members; in fact, the negotiation process is the first time Employees have a voice. The UFCW will put forward proposals during negotiation that the employees have determined to be priorities; this means the employees contribute to what actually goes into the Union Contract. Legally, you may speak about the Union on company time: something that employers seem to forget. 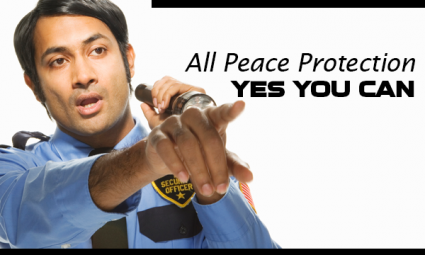 The new Union members at All Peace Protection, can expect that their union will be there to remind there employer about all of its obligations every time they forget. Should any members have any questions regarding the legalities of the Unionization process please contact Saba Mossagizi at 780-920-3773 or smossagizi@ufcw401.ab.ca.